After writing definitive biographies of theatrical greats John Gielgud and Sybil Thorndike, author Jonathan Croall turned to a subject a lot closer to home – his own father, the actor John Stuart. While Stuart – he changed his name from Croall for simplicity’s sake – may appear to have lacked the star quality of a Gielgud or Thorndike in his later career, he was in fact every inch the star in his youth. Between 1920 and 1930, he made 55 silent films in the UK, including 20 shorts, of which 11 have survived. Tall, dark and handsome, he was one of the most popular actors in the country for a while, a veritable heart-throb, rivalling the popularity of Rudolph Valentino and Ivor Novello. In the early days of cinema, its stars were quite modestly paid and to make a living you had to keep at it. Stuart averaged seven films a year for six years, moving swiftly on to the next as soon as one was finished. “All the time you’ve got to keep learning, work like the devil, never relax, and never be satisfied,” the young actor told one interviewer. Although he always appeared relaxed and in control onscreen, it was evident from this quote that it took its toll. By the time his son Jonathan was born in 1941, Stuart’s years as a screen idol were behind him, although he continued to appear as a character actor in films – and on the stage – up until his death in 1979. In his new book, Forgotten Stars – My Father and the British Silent Film World, Croall cleverly weaves his father’s story into a more general study of the silent film era. Back then, stories were told in primary colours, and actors tended to be typecast according to their looks and predispositions. Because he was clean-cut and nice-looking, Stuart was usually a dashing hero of one sort or another. However, he managed to ring the changes, playing among others a Canadian rancher, a Cornish fisherman, a Welsh musician, a shop assistant, an Irishman, and the skipper of a racing boat. Accents presented no problem, since there was no sound other than a piano accompaniment. Unlike a lot of less fortunate silent film actors, Stuart made the transition to talkies in the late 1920s with considerable ease, thanks to “a pleasant, unforced tenor voice,” as his son describes it in the book. Just as he seemed to be on the brink of a lucrative career in American films, with the offer of a five-year contract by Paramount Studios, Stuart opted to stay at home and support the struggling British industry, about which he always spoke passionately. One of his co-stars from the silent days, Mabel Poulton, fared less well in the new talking- picture era. Croall tells the story of Poulton saying to Novello, on the first day of filming The Constant Nymph in 1928, “’Allo, ’ow are yer?” Novello thought it was a joke and replied in equally broad cockney, only to discover this was Poulton’s natural accent. It was to be several decades before anything other than received pronunciation was acceptable to British film-makers. 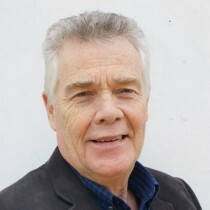 A busy career as a stage actor ran parallel with his film commitments from the start, and Croall estimates that Stuart appeared in more than 100 plays over five decades. He appeared in a popular revival of Somerset Maugham’s Our Betters in 1923, and managed to make four films at the same time, dashing from the studio to the theatre at night. In researching his father’s illustrious acting career, Croall was astonished by the early acclaim for his film performances. “By the time I was a teenager, my father was in his 50s, and beginning to have spells out of work,” he explained. “I had this image of him in his study waiting for his agent to ring. It was a long time before I appreciated the full extent of his fame and popularity. “Occasionally, when we were out and about, he’d be stopped in the street, usually by a slightly older woman, who might ask him for his autograph, but he never harked back to his years of stardom and I never got the feeling he was disappointed. He was an amiable character with quite simple tastes. When he was at home he seemed perfectly happy going to the pub and playing bowls.